Arrh, it's happened again! Finding the time to sit down and focus on writing has become quite the problem. Being a father, husband and manager (and sometimes babysitter to a large group of staff ) all looking for a slice of my time, leaves me with precious little for my own pursuits. Fortunately, I have a few moments of quiet that I can refocus on the follow up to 'Life on an island', part 2. Nevis is just like the image conjured up in all those glossy travel magazines. 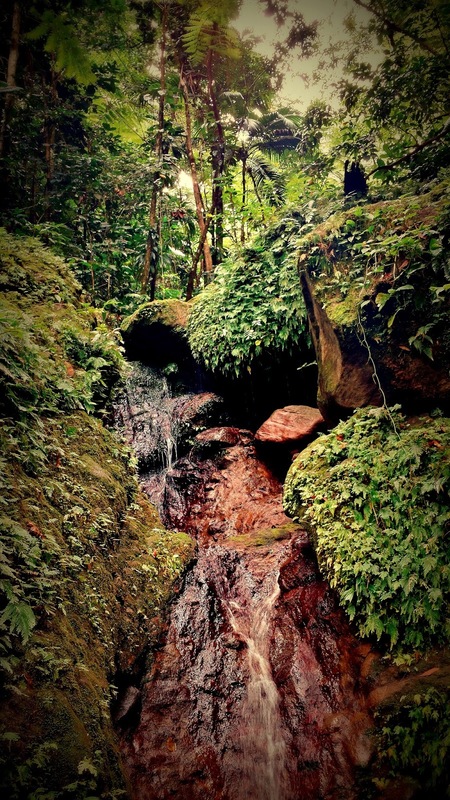 White sands, sapphire blue oceans and emerald forests (well, just during the rainy season) welcome you as you arrive. However, Nevis just like all the other islands is more diverse than just sand and sea. So let me take you on a little tour of our Rock! For the newly arrived your experiences start at our international airport. Most tourist began their adventure to the islands navigating sprawling airports with multiple flights heading all over the world. 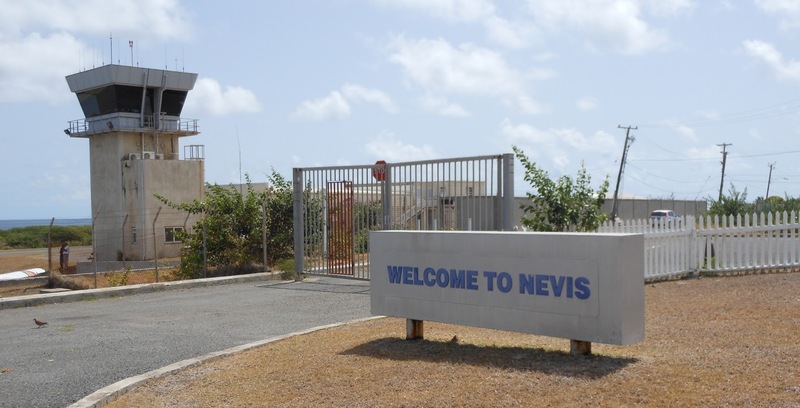 Nevis has simplified this process by having just the one gate and keeping the clutter of flights to manageable few a day. Truth be told, the runway isn't long enough to accommodate big 'people movers' so most visitors to Nevis come through the bigger airport in St. Kitts. However, if fortunate to arrive directly here on Nevis, your transition from aeroplane to exiting the terminal is a simple walk with a few fellow passengers only stopping briefly with customs and passport control. That's the beauty of small airports! 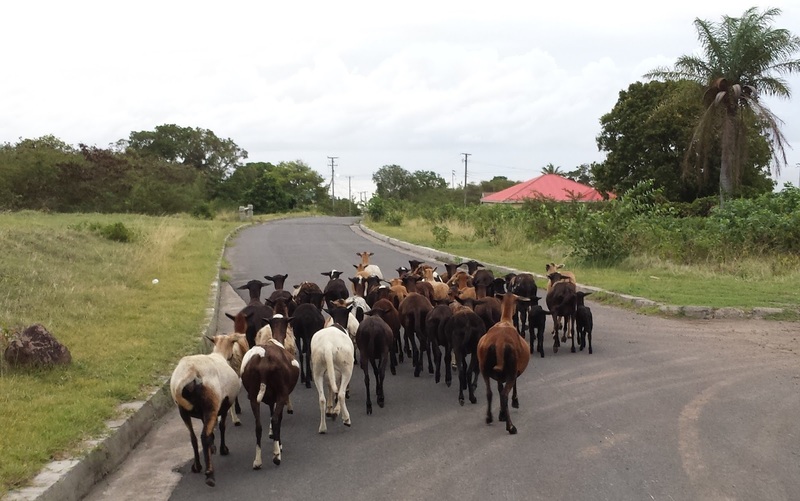 Rush hour - Nevis style! Once cleared to enter the island your first Caribbean experience starts in the parking lot. As airport carparks go, this one has ample spaces right up front. The experience I mentioned is the fact that the sheep and goats outnumber the amount of parked vehicles. Its not uncommon to see them walking past the front sidewalk enroute to a new patch of grass to chew on. Nevis is awash with roaming livestock of various kinds. 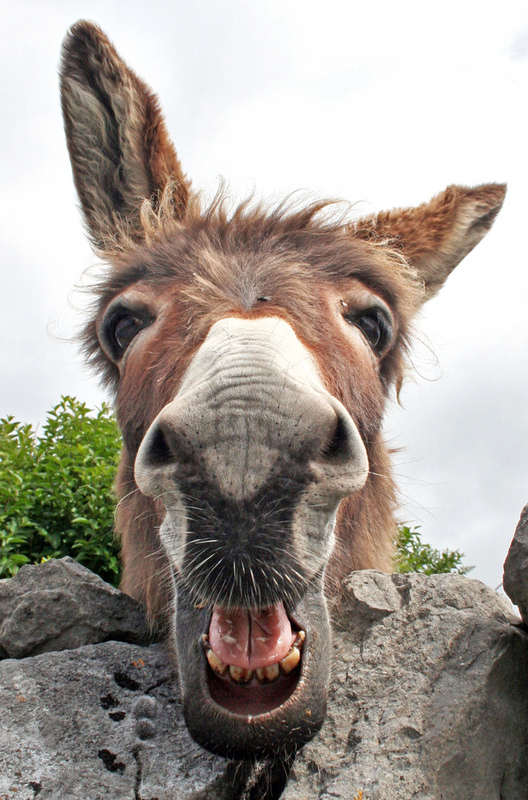 The resident population of goats and sheep found at the airport can be seen all over the island foraging for food. Coupled with this, you'll find bigger cows, horses and now feral donkeys that were once the prefered mode of transport before the arrival of cars. Rarely, you might catch a glimpse of an old timer riding up the mountain on the back of a mule, but these days it's mostly done inside the airconditioned cab of a truck. From the air, Nevis looks like it rose on the back of an old volcano come out of the depths of the ocean. 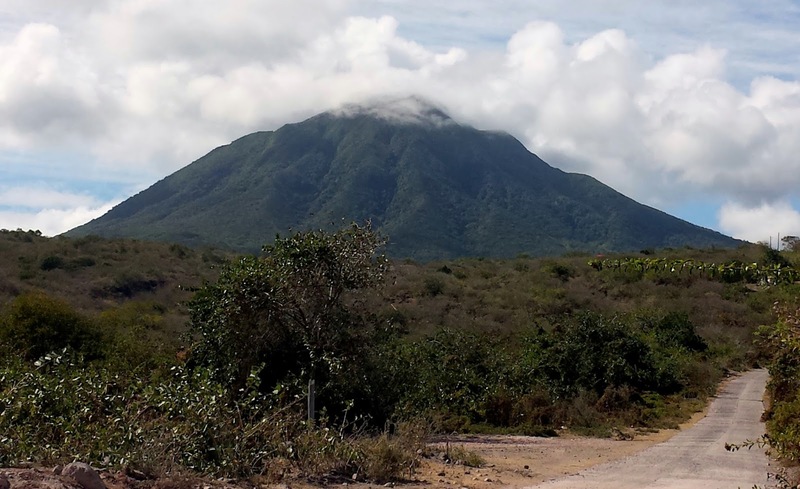 Though true, Nevis Peak is an impressive 3232 ft, we have a total of seven very much older, smaller and extinct volcanoes that make up the island. Nevis Peaks elevation helps in providing much needed rain by stopping the clouds that have traveled the Atlantic so relieve themselves of excessive evaporative moisture. It's worth pointing out that locals don't see rain as a negative but instead refer to a rainy event as receiving 'Blessings'. This is because the Caribbean is classed as the dry tropics with an average rainfall of around 50 inches with temperatures fluctuating in the 80's (fahrenheit) yearly. Nevis Peaks dominating presence was part of the reason Nevis got it name. Columbus was one of the first europeans to lay eyes on the island while traveling to the new world. Before Christo traveled through these parts the native Carib Indians called this island 'Oualie', translating into "land of Beautiful Waters". However, when Christo did travel through in 1493, Nevis appeared on following Spanish maps as "Nuestra Senora de las Nieves", which translates to 'Our Lady of the Snows', for the cloud covered peak that can look like a snow capped mountain. The cloud covered peak enables the chain reaction of cloud to rain to happen. The racing winds that have moved those clouds across the Atlantic decides where the rain should fall. For this reason our island has many diverse ecosystems and plants that thrive only in these environments. The east side of the island faces the open ocean and is as dry as many deserts. In fact, the rock strewn landscape has a lunar look, with the occasional cactus poking up through foreign Acacia's that have naturalised across the island from there original african homes. The powerful Atlantic wind has carved the plants in these environment into interesting and tortured shapes. 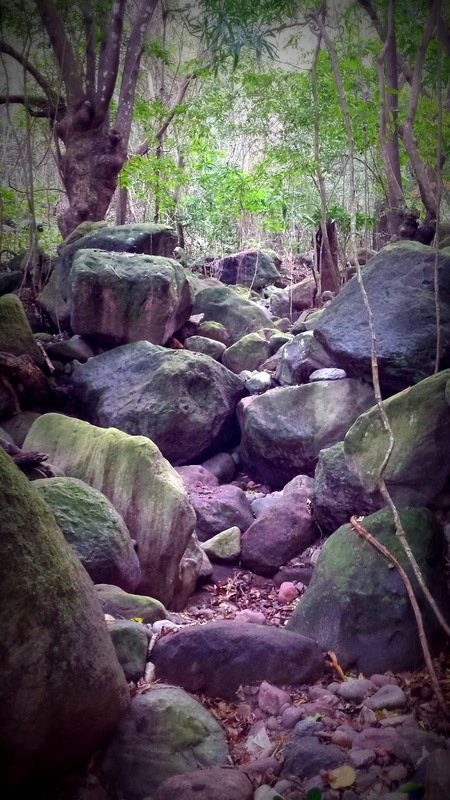 Boulders lend some protection to plants, but their growth is restricted to the shadow of these rocks. 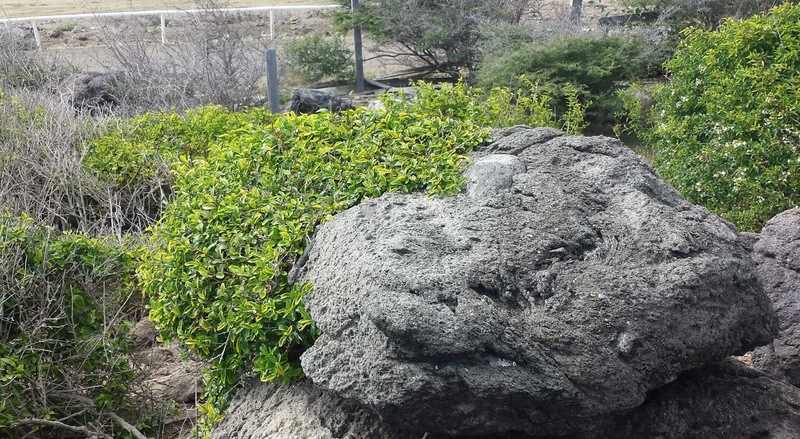 For this reason, the plants growth can undulate, mimicking the waves that crash along the coastline. Further inland, the wind begins to give way and trees start looking more like trees than the tortured specimens most bonsai fanatics would lust for. Rain is still limited but with the wind beginning to be dispersed, moisture has a chance to percolate down to the roots. However, things beginning to get interesting when you reach the slopes. Through years of rainfall and runoff, deep canyons (or locally referred to as ghauts) have carved themselves into the mountainsides creating sheltered, humid rich environments. The steep walls of these ghauts are clothed in dense coverings of ferns, gingers and begonias to name a few. Cooler temperatures and massive water smoothed rounded boulders create a zen-like sanctuary, peaceful and separated from everyday life of the island. Towards the summit, the ghauts disappear and thick moisture rich cloudforest take over. 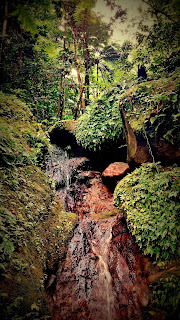 Sadly, this is a world that I still need to experience as my work keeps me to busy to explore. I've been told that the vegetation is controlled again by the same Atlantic winds, keeping the tree height to a minimum. However, the moisture rich clouds allow epiphytes like Orchids to drip from the limbs of trees making up for the lack of height. Everyday I watch the clouds swirl around the peak to swallow it up from view, only clearing occasional to give a glimpse of a world often hidden in the mist. I would be amiss to not mention the other feature of Nevis also seen in travel magazines, Monkeys! Naturalised from Africa, the Green Vervet monkeys were brought to the islands as exotic pets and after escaping captivity grew in number. They are loved by visitors, but despised by islanders. Sure, they're cute to watch and bring hours of enjoyment as they run, climb and play but they're as destructive as deer. Agriculture on Nevis has almost been obliterated by these furry thieves as people give up trying to provide produce for themselves. It's no wonder that people who catch them for cooking call monkeys 'Tree Mutton'. Well, this is just a small glimpse of the island my family and I now call home. As and when time allows, I'll write and tell stories of our adventures of life and gardening on the island. But for now I need to shoo off the monkeys from the Mango tree and throw the kids in the pool to cool off. Great blog! I enjoyed reading your post. Thanks for the info and for sharing! We are looking at the indoor-outdoor living style that European-inspired havewicker coffee table embraced, http://www.gardenarteu.com we ve designed these pieces to seamlessly integrate with the modern lifestyle. says Roger Cao.Have a look through the gallery below at Gardenart s outdoor collection and visit garden furniture stores to find your nearest store.This is very high-end and high quality furniture product with affordable price because it is manufactured in China. We are astonished by the quality and the low price with such a fine piece of outdoor furniture.GARDENART is manufacturer of high-end outdoor furniture with production base in south China. woven garden furniture Gardenart concerns itself with the latest trend in the market and bringing innovative design has become core competence of the company. We hope that we would have Gardenart your furniture of choice.